When last we met, W.P. 5th graders and I were talking about what Actually scared them. What happened after that conversation is this: They were assigned to write a story. A scary story. The caveat? It had to be based on one of the truly scary situations the class had just listed. Thus assigned, they set to work. Well, half of them set to work, furiously writing like the diligent students they are, instantly creative and exuding confidence in their ability as storytellers. The rest sat and looked at the intimidatingly white paper in front of them, and wrote their name slowly and carefully in the top right corner. Some wrote their name and the date and the word “Help!”. And then they got stuck, stopped, and passed the rest of class sharpening the perfect pencil. Hoping to avoid the same scenario in today’s class, I arrived armed and ready with my favorite secret weapon to get students writing: the guided free-write. There are many versions of the free-write, and this is a curtailed version of the more extended ones that opened every playwriting class I took in college (thanks to Naomi Iizuka for introducing me to the technique). There are a fair number of rules, but in this case, the rules are the key to freedom. No one will ever read this. Not me, not the classroom teacher, no one. Because no one will ever read it, complete sentences are not required. No erasing. Cross out words if you have to. It’s best if you don’t correct at all. Write the word in whichever language comes first. Even if it’s a made-up language. Go with your brain. If the prompt is about Breakfast and two sentences later you are thinking about recess, go with it. If you get stuck, write over and over and over again “what I really mean to say, what I really mean to say, what I really mean to say…” until you latch onto something else. When time is up, pencils down. I introduced the rules, and gave the class their first one-minute prompt: These are the things I like. One minute. Go. The ‘go’ became the starting gun in their race to write down as much as they could in that one minute. It was pure, unbridled, furious writing–the exact opposite of last week’s story writing session. We did four one-minute prompts before a final two-minute write, and even if the class hadn’t cheered every time I told them we had another prompt coming, I could clearly see everyone was into it. Every single student. Because of Rule #1, I have no idea what any of the students actually wrote (many recycled their papers at the end of class when given the option). What they write isn’t the point–it is how they write that I am seeking to change. No matter the words that come out, the students are writing; energetically, enthusiastically writing for a total of seven minutes. When the exercise was over, I asked them to finish the scary stories from last week. Without exception the students took out their stories, and got to work. 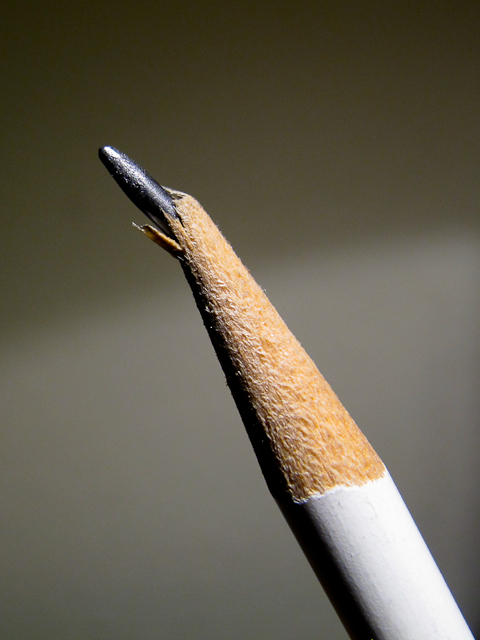 Somehow, not one pencil needed to be sharpened.